Whilst we would generally advise where possible purchasing the official Oral-B brush heads, there are some benefits to be had by purchasing alternative brush heads, not manufactured by Oral-B. The primary benefit, is cost. In fact, it is quite scary just how much difference there is in the price, we are not talking about pennies here, there can be tens of pounds to be saved. It is worth being clear, that these brush heads we are talking about are replacement brush heads similar to the originals offered by Oral-B, but are made by other companies. Aftermarket or third party brush heads as they are often known are not designed to be replicas of the originals. They will not carry the Oral-B logo or branding. They will have their own brand name or no name in many instances. 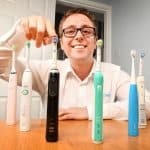 There are countless companies making brush heads for Oral-B brushes and some will be better than others in terms of quality and features they offer. Although they can act and look very similar to originals and some may think that they are fakes or counterfeit, they are not. In our article, fake Oral-B brush heads, we explain all we know about counterfeit brush heads. No indicator bristles – The bristles do not change colour to tell you when to replace your brush head. Tight bristle formation – The bristles are not always as tight in their formation with a few ‘loose’ bristles. Range of options – There tends to be 1 style of brush head from a company and not the many different styles offered by Oral-B. Colour rings – Not all have interchangeable coloured rings. Quality – The strength and quality in the head is not as good as the original. They do not fit right, last as long and tend to break easier. Package language – The packaging is not always in English. We have no evidence that these aftermarket heads are really as good as the originals, and in fact general user opinion tends to agree. But there is also the possibility that the bristles on the cheaper brush heads could be doing damage to your teeth as they may be more abrasive than those used on Oral-B original brush heads. Should you ever have concerns do speak to your dentist for professional advice. When it comes to aftermarket brush heads, you often get what you pay for. Whilst buying 4 brush heads for a £1 is perhaps possible, is this a little too cheap? 4 brush heads for £3-4 is more expensive, but for this price but for this you may get a bit better quality. The cheapest and best alternatives to the originals? We do not have 1 favourite option, but there are a couple of strong contenders. Molarclean are one of the best known branded alternative to the originals. They come in packs of 4 or 12. The quality is very good, but they do not have indicator bristles like the originals. Coloured rings are included, but these are pre-fitted and not interchangeable. You can read what we have to say about Molarclean in our hands on review. At the time of writing (prices are always subject to change) a pack of 4 x Oral-B Cross Action replacement brush heads costs anywhere from £11.99. This makes the price of each head at least £3. Molarcleans equivalent works out at about £1 per head cheaper. There is a pack of 12 too, which works out even cheaper. Compared to the equivalent number from Oral-B there is a cost saving of £1.39 per head. That’s over £25! View Morlarclean on Amazon. Another strong option are those from Roch. The Power Clean Plus brush heads (view on Amazon) look very similar to the Oral-B originals, but they too do not have fading indicator bristles. As you would expect they are much cheaper too working out at approximately £1 each! However, there are cheaper options still and they have rave reviews with an average rating of 4.5/5. Opt for these brush heads available on Amazon and the prices are quite simply amazing. A pack of 4 at the time or writing is just £2.75 and a pack of 20 £6.99. Compared to Oral-B originals that is £9.24 cheaper on a pack of 4 and for 20 that is a saving of around £43! At the end of the day, which you opt for is your decision. We have laid out the pros and cons, but the prices of these third party products are very appealing and we would not be surprised if you opted for these. Whatever you choose, make sure you keep up a good cleaning routine. If you had to ask us which brush heads to buy our immediate recommendation would be the official Sonicare heads from Philips. You can be assured of the quality and reliability of these heads. However, even we agree that the prices of the heads from Sonicare are on the high side and are more expensive than their main competitor Oral-B. Thankfully there are alternative options with the primary benefit being the cost. You can actually buy a pack of 4 for the cost of a single official brush head! It is worth being clear, these brush heads we are talking about are replacement brush heads, similar to the originals offered by Sonicare, but are made by other companies. Aftermarket or third party brush heads as they are often known are not designed to be replicas of the originals. They will not carry the Philips Sonicare logo or branding. They will have their own brand name or no name at all. For all intents and purposes though they can act and look very similar to originals and could be interpreted as fakes, but they are not fakes. Our guide to fake Philips Sonicare brush heads goes into all the detail you need to know. Naturally, aftermarket or cheaper options have drawbacks. Tight bristle formation – The bristles are not always as tight in their formation, you can get a few stray bristles. Range of options – There tends to be 1 style of brush head from a company and not the range offered by Sonicare. Quality – The strength and quality in the head is not as good as the original. They do not fit right, last as long and break easier. There is a very fair argument in that you get what you pay for with these brush heads, but even so these aftermarket options have a lot going for them and few can really argue with the quality or reliability and the risks associated when you see the cost benefits. We were very impressed with the heads available from Tillvex, view them on Amazon. For £11.49 you get 8 heads. That is £1.43 per brush head. The Sonicare originals would cost over £50 and work out at £6.38 per brush head. £4.95 per head more expensive and virtually £40 more for a pack of 8! With an average rating of 4.5/5 the compact brush heads by Oliver James come in at just £12.98 for 20. View the Oliver James brush heads on Amazon. These brush heads come in at £0.65 each, whilst the originals would cost £5.29 per head more. That is £105 more to buy the official brush heads. Whilst these do have some drawbacks, that is enough spare change to buy a couple of new electric toothbrushes. At the end of the day, which you opt for is your decision. We have laid out the pros and cons, but the prices of these third party products are very appealing and we would not be surprised if you opted for these. Whatever you choose, make sure you keep up a good cleaning routine. Thanks so much, Jon; those screw-on replacement brush heads look exactly what I am accustomed to. I must say the the two I purchased at Target a year or so ago must be by other manufacturers, for I am already looking to replace the one I’ve been using for only a few weeks because it leaks H2O. I finally figured out last night that the top of the handle was retaining water from rinsing the brush and handle assembled and then it is now leaking. Great, glad the link helped. They are Sonicare originals. There are many equivalents from other brands, the primary benefit being a lower price, but as you have just explained, the quality might not be quite as good. I hope if you do get them and buy them that they are just what you need. This is too somewhat of a compliment to Philips Sonicare for just how long the brush has lasted.